No to ‘subsidiary companies’ in the NHS! A ‘SubCo’ – as subsidiary companies are sometimes called – is an independent company wholly owned by a parent organisation that NHS trusts can set up. They are like an independent business where the owner is the Trust board, initially at least. Groups of staff can be transferred to a SubCo which then becomes their employer. They pose severe risks to NHS workers and should be opposed – as they were, successfully by Unison South West Region, Unite the Union, RCN and campaigners in South West England. But not so at Gloucestershire’s hospital trust! where Gloucestershire KONP campaigners are angry and organising against the foundation trust’s decision to go ahead. Why are SubCos creeping in to the NHS? Unions, health campaigners and political commentators believe that SubCos present a form of ‘backdoor privatisation’ and could lead to “commercialisation” of hospital assets with dire consequences for staff, and the NHS. Meanwhile, the DoH states that while it is not acceptable for NHS Trusts to seek advice for, or undertake, schemes to solely gain a tax advantage (tax avoidance), if there are ‘genuine commercial reasons’ for entering into contracts which, as a by-product, have a ‘tax benefit’ then this is acceptable. This is Alice in Wonderland thinking. So far nineteen trusts have transferred non-clinical NHS staff and tens of millions of pounds of assets into SubCos and another 16 have plans to do so. Neither staff nor public have been told anything about what hospital buildings may be involved, nor whether asset transfers are key to any supposed VAT savings. 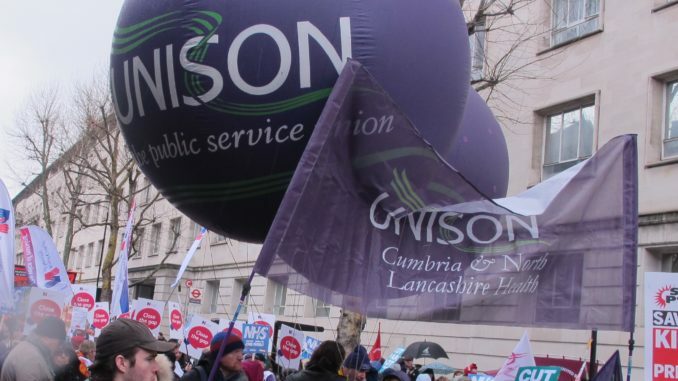 In Wigan, Harrogate, Bradford, and Calderdale, Unison members are close to strike action. A major firm of legal advisers say that it is because of recent changes in legislation that NHS Trusts can transfer their legal rights in operational property to another company. The 6.9 million hectares of NHS land in England is a mouth-watering proposition, and the stretching targets for asset disposal required by NHSE force Trusts to focus on their estate for survival. SubCos are separate legal entities, and as such they can become ‘neat vehicles’ for delivering estates services across the new STP regions, developing so as to involve multiple owners. In North Bristol local staff, unions and campaigners from Protect Our NHS have forced trust managers to scrap the idea of setting up a SubCo. The plans, first revealed by the Bristol Post, would have seen 850 staff initially transferred, and were slammed as they would divide staff, with people working for the private company ending up with worse pay and conditions. North Bristol NHS Trust paid £12,000 to an established SubCo from the North East for a feasibility study. Health campaigners were concerned that “If implemented, this plan would almost certainly worsen the service as the affected staff would be demotivated and relatively impoverished.” The initial plan had been for non-medical staff, but unions had been told that all staff, including doctors and nurses, could end up being transferred. Meanwhile NHS Airedale Foundation Trust when asked to give examples of the sort of growth planned or commercial work of their SubCo, replied: ‘we have a number of ideas but they are commercial in confidence’. Familiar and so, so alarming! KONP supports NHS staff and Health Unions to stop SubCos. Challenge trusts over their decisions to set up wholly owned subsidiary companies. Ask MPs and Peers to table questions in Parliament about SubCos and to press the government to protect staff and the NHS. In Gloucestershire the staff are being told over and over they will remain a part of the NHS ‘family’ and they will not be worse off. Now, of course, a pay deal looming, the reality will hit home. If extra money is to come from a separate fund to the trust’s own then, once in a SubCo, this extra money could only be offered to SubCo staff if the SubCo owner coughs it up themselves. The govt offer does not apply to private companies. Does anyone really believe the trust that owns a SubCo is going to rummage for extra money to give to their staff in their “NHS Family” privatised business?! Our health service must be saved and given back to our masses. A Jeremy Corbyn Government is the only answer. Labour founded our health service and the Tories have fucked it up whenever they come into power.